When Tammy Bolerjack was diagnosed with cystic fibrosis at age 18, she found herself frequently in and out of hospitals for treatments to help her breathe. Running 5K races and half-marathons certainly wasn’t something she envisioned in her future. 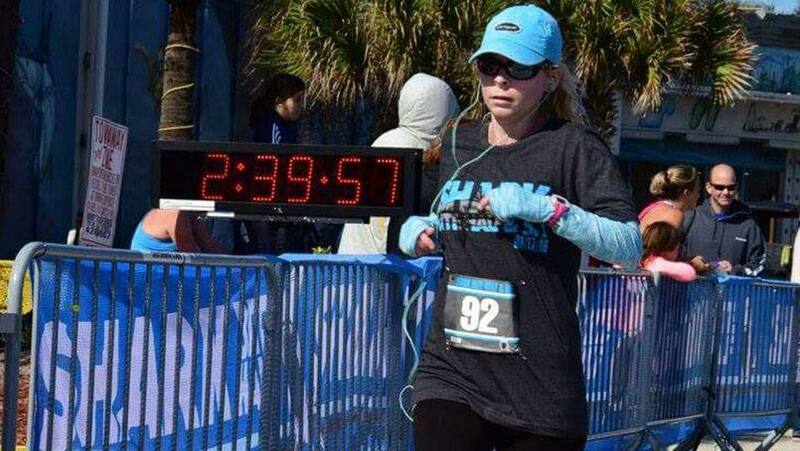 Little did she know then that eventually a double lung transplant at Mayo Clinic's Florida campus would not only allow her to breath normally, but would motivate her to become a fitness enthusiast and a competitive runner. Cystic fibrosis is a genetic disorder that causes severe damage to the lungs and digestive system. It affects the cells that produce mucus, sweat and digestive secretions. Normally thin and slippery, those secretions serve as lubricants in the body. In people with cystic fibrosis, however, the secretions are thick and sticky, clogging airways, tubes and passageways in the lungs and pancreas. In more than 75 percent of patients diagnosed with cystic fibrosis, the disease is identified by age two. As the condition progresses, trips to the hospital usually become more frequent because the secretions need to be cleared to allow normal breathing. When the disease gets to a critical point, a lung transplant often is the only treatment option. Diagnosed in her late teens, Tammy had an unusual case. She didn’t experience many symptoms as a child, but in the years after her diagnosis, her symptoms of cystic fibrosis began to get worse. In 2010, at age 33, Tammy ended up in the emergency room of a hospital near her home in Port Orange, Florida, after her lungs clogged and she couldn’t breathe. She was drowning in her own fluids. After her condition was stabilized, Tammy went home. But as symptoms continued, her doctor eventually referred her to Mayo Clinic in Jacksonville, Florida, for a lung transplant evaluation. In August 2011, Tammy began what were to become the two most important weeks of her life. On the evening before her evaluation appointment with Mayo Clinic’s lung transplant team, her symptoms became so severe she had to go to Mayo’s Department of Emergency Medicine. She was put on a ventilator to help her breathe. At that point, Tammy was told a double lung transplant would be necessary to save her life. Doctors expressed a sense of urgency, as Tammy could only survive for 14 days on a ventilator in her current condition, which was deteriorating fast. She was immediately placed on the top of the lung transplant list and kept alive on a ventilator while waiting. On the 12th day of ventilation, Tammy got her gift. Two lungs that matched her blood type, tissue type and size became available. She underwent double lung transplant surgery on Aug. 28, 2011, at Mayo Clinic. Key to Tammy’s recovery after surgery was postoperative physical rehabilitation. Determined to make herself strong again, Tammy elevated the mandatory rehabilitation to a whole new level. “My biggest personal passion is running, and I took the opportunity of my required physical rehab to step things up a notch and really try to get into shape and go beyond what was required to maintain my health and keep my new lungs working properly,” she says. Only six months after the transplant, Tammy ran her first 5K race. She followed it up with a total of 12 5Ks in the first year after transplant. Today, five years later, she has competed in more than 25 5K and 10K races and more than 12 half-marathons. Tammy acknowledges that she owes her life to her donor, a young woman in her 30s who suffered brain damage, as well as the transplant team at Mayo Clinic who kept her alive until she could receive her life-saving transplant. Explore Mayo Clinic’s Jacksonville campus.